To study sedimentology and the deposition of rocks at different stratigraphic layers, it is necessary to dig trenches or stratigraphic columns. When digging a trench, it is essential to be on a hill or butte, and it helps if it’s steep. Digging a trench is no easy task: building one consists of using a pick-axe to hack away at the rock surface, a spade to clean the hacked areas, and a shovel which is used to clear all the dirt away. A column should be precise, with even cuts, and a 90 degree vertical back wall, so that data is consistent throughout. Trenches should also be dug in steps which creates a set of stairs that show what is happening in multiple frames of time. We had to take care not to make a step on a contact between two different layers, so that the diagnostic features of the rock faces are available to analyze. It is important that you dig the trench yourself, as opposed to having other people dig it, so that you may learn as you dig. Seeing the process of trenching as it happens will help you understand the different rock layers as they are exposed. When studying sediments, the layers of sediment can't be used to measure time without careful examination. For example, while one sediment may take thousands of years to form a layer on the Earth's surface, but many only take a few years or even a day in some extreme occasions. This means that some points in time may be represented more than others in the sediment layers, and it shows that time isn't always represented in equal increments. Another complexity comes with erosion. Water can erode away old sediment layers and replace them with new ones, causing much newer sediments to be deposited just as far down as much older ones. The importance of knowing what amount of time sediment layers represent is showcased when paleontologists are collecting data on the age of a fossil because they have to know how old the sediments around the fossil are to determine the age of the fossil. The trenches are dug in order to find boundaries between rock layers which represent changes in the ecosystem throughout time. Boundaries are made up of faces which consist of four types of stones: mudstones, siltstones, sandstones, or conglomerates. In addition, boundaries can have a mixture of the layers so it's not unusual to have a silty mudstone or a silty sandstone. Boundaries also represent a change in the ecosystem in a certain amount of time. For example, Dr. Bercovici explained that lakes can cause some layers to appear much older then they really are. These changes can tell us what the ecosystem was like in that time frame. This gives us a better understanding of what life was like for the living organisms of that time and creating a time line for vertebrate paleontologists to contextualize their finds. After walking through sage bushes, eying shadows for snakes, and crawling over iron conglomerates churned out of a mound of mud, I saw my first ever wild stingray. Exploration purists and general sticks­in­the­mud may dispute the validity of my claim that it is a wild stingray. I can hear them now saying hairsplitting nonsense as “it was dead,” “that was just a chunk,” or “it only counts if its from this era”. I know of no statute of limitations on wildlife and refuse to surrender the claim of my first wild stingray to pencil pushing bean counters, a fossil tooth is certainly wild. This particular stingray saw its day come and go over 66 million years ago living its life on the coasts of the Cannonball Seaway that once split the east from the west of North America. This particular little batoid swam alongside crocodiles and champsosaurs, in waters waded by theropod dinosaurs. When this beautiful, and undoubtedly wild, chondrichth swam in the oceans of what would one day be a landlocked state, there was no indication that it was occupying the last chapter of an era, that the mososaurs and ammonites it shared its sea with, the dinosaurs that lumbered on the land, and the pterosaurs that flew above would be ripped from time by a celestial impact that would prove to shape the next 66 million years of this planet. That's probably a wilder stingray than I would have seen fluttering around any of the Bahama islands. My favorite aspect of fieldwork is the surreal and sometimes unfathomable ability to travel into deep time. Often when I travel I get the feeling that I am just skating along a cross section of Earth only appreciating its freshest face, but when you step over extinction boundaries and 66 million year old ray teeth you can see through the opaque fog of time and connect to our former world. The ultimate reason I am passionate about paleontology is because I want to see the world. When I hold in my hand stingrays from eras lost, the more I learn, and the more I understand them, the more that geologic distance of time seems to dissolve. Without a paleontological perspective one can see of Earth maybe 100 years, but with that perspective that vision is extended by billion of years, and I can say, without a shadow of falsehood, that no experience in my miniscule life has enriched or greater expanded my view and connection with this beautiful planet than the time I spent in the field. On this trip I have the privilege of collecting fossils from two important time periods, the Paleocene immediately following the K/T extinction event that wiped out the dinosaurs among others, and the Eocene where modern mammalian orders emerge. Our crew spent two weeks camping and prospecting for Eocene fossils in the Wind River Basin of Wyoming and two weeks at the glorious bunkhouse in Marmarth ND, screening matrix to find Paleocene fossils from Montana. I have encountered an array of wildlife from bison and deer to prairie dogs and horned toads. I was stared down and barked at by pronghorn and also saw several species of snakes. Growing up on the east coast I never experienced anything quite like the midwestern terrain. I’m not exactly accustomed to vast open areas with nowhere to escape the intense radiating heat of the sun. There were days where six liters of water and a handful of electrolyte tablets were just enough to remain hydrated. Thankfully there was a steady breeze keeping us cool on top of Camel Butte where we did the majority of our dry screening work in Montana. Unfortunately that breeze also blew all the sand from the screen into our eyes, noses, mouths, and ears. Most days we came off the butte looking like coal miners. For all the harsh, unforgiving qualities of this region, it is an incredible place. Spending days in the vast badlands where people are few and far between and fossils are abundant and eroding out of cliffs gave me a new perspective on humanity’s place in the grand scheme of time and space. As cheesy as it sounds, I felt a tremendous connection with the past and the events that occurred making my life possible. If it weren’t for the extinction of the dinosaurs its doubtful that life would exist as we know it. It’s a shocking reminder that to some extent life is ruled by random chance and to the degree we can measure and calculate scientific data there is still much that remains out of our control. I am truly grateful for this experience at the Marmarth Research Foundation and my two weeks of camping and prospecting in Wyoming prior to this. It’s been an amazing and inspiring learning experience with a group of great people. Not to mention a much needed break from day to day life in the city. However, after a month of fieldwork, I have to say, I’m also pretty excited to go back home. Living in New York, you get used to the hustle and bustle of crowded roads, trains, and sidewalks. Push or be pushed. What struck me first about Marmarth was its quietude, which stands in stark contrast to the clamor of New York. Marmarth is a small town where you have time to stop and get to know someone. People here are convivial and patient. Drivers don't rush you to cross the street. Once we began excavating at Camel Butte with my group from Yale University and Brooklyn College, I discovered that it was not always this quiet. We can see that by the multitude of fossilized remains of creatures that roamed this region millions of years ago. Seeing them all was like living inside a history book. Our goal for this excavation was to locate mammalian teeth from the Paleocene strata. It was exciting that we were able to pick a few teeth out from our matrix just when we were screening on the butte. We also uncovered evidence of many other animals that once populated the area, including crocodiles, turtles, and gar. We also had the opportunity to prospect lower on the butte in the Cretaceous strata and found an assortment of different dinosaur fossils, which is something I never thought I'd experience. I enjoyed my time picking through our matrix, late at night, looking through giant piles of rocks for little tiny fossils and I've grown to enjoy hiking up Camel Butte and sliding back down after a long and windy day. I'm glad I was able to complete this field school with other students, all of whom I have established friendships with and look forward to working with again in the following year. This trip has been marked by a number of profound episodes. I believe studying how our world has arrived to where it is today is one of the most intriguing challenges there is. With each day we increase our understanding of our neat planet and I'm fascinated in observing where this research takes us. I owe much gratitude to my professor, Dr. Stephen Chester, and to his colleague, Dr. Eric Sargis, and all of the people at the Marmarth Research Foundation. This summer’s fieldwork in Wyoming and Montana has been quite the experience. We began by spending two weeks camping in the Wind River Basin of Wyoming to prospect at Eocene fossil localities. Prospecting at these localities was super fun because they all tended to be rather fossiliferous. We were primarily interested in collecting mammals and found fossils from multiple taxa, mainly horses, rodents, and primates. The primates were of particular interest to much of the crew, as they represented early members of the order and can aid us in answering important questions about primate origins. After much of the team left for home from Wyoming, the Brooklyn College crew made their way up to Marmarth, North Dakota where we would stay while we worked in Montana. For the first few days we worked on identifying the fossils that we had collected in Wyoming as the weather did not seem ideal for going out in the field given we had to hunker down as a tornado flew by. Understanding more about what we had found was one of my favorite parts of the entire experience. Fieldwork in Montana was a very different process, but a fun and rewarding one as well. We worked primarily at a Paleocene locality called Camel Butte, and screened sediment from a specific location at the top. The butte was super windy and this made for an incredibly dirty and pretty funny experience. We bagged the sediment for further screening and bubbling at the lab, and then worked on picking through some of the matrix to find fossils. This process is rarely immediately satisfying, but for me it is one of the most exciting parts of fieldwork because of the kinds of the taxa that we can find. We can find fossils (usually isolated teeth) belonging to multituberculates, condylarths, and even primate relatives. Some of the specimens we find may represent early radiations of extant mammalian groups and help us learn a lot about the evolution of these mammalian lineages. Others, like multituberculates, went extinct but are still incredibly important in that they were a successful radiation for a long time and survived the mass extinction event that wiped out dinosaurs. Another highlight of the trip was being able to prospect for dinosaur fossils. As someone who studies mammals, dinosaur fossils were so different and interesting to me. Overall, staying in Marmarth has been really neat as well. I definitely enjoy spending time in a small town, as opposed to being in New York City where I grew up and currently live. I really loved being around animals that I don’t usually get to see, like pronghorn. We even took a trip to Theodore Roosevelt National Park and saw bison and prairie dogs. Even cows, rabbits, and deer are a rare sighting where I live, so being surrounded by them was exciting for me. Everyone at the Marmarth Research Foundation has made our stay fun and comfortable and I am very grateful that I have had the opportunity to work with such amazing researchers and overall great people. I can’t wait to come back in future summers! Share your passion for knowledge and science! This is what I do. As an educator at the Denver Museum of Nature & Science a large part of what I do is share my enthusiasm for science with others through programs, exhibits, and trainings. What better way to be a catalyst and inspire others to be curious about the natural world than to go do it myself? 12 years ago I finished my degree in geology and since then I have not spent much time out in the field. This year we are filming a new video for the Prehistoric Journey exhibit at DMNS and when the opportunity arose to head to the KT for a few days to help film I definitely didn’t say no. Ask anyone who knows me and they will tell you that I am not shy about my passion for dinosaurs. Heck, I have some permanently tattooed on me! I never would have said that I was in need of a recharge but after two days getting my hands dirty in the late Cretaceous of Montana my fire has be reignited. Museums are about authenticity. We have the real stuff. The real dinosaur bones, the real moon rocks, the real mummies. We also have the real people. Great scientists like Dr. Tyler Lyson who spend their summers investigating what exactly happened before and after the KT extinction so he can share that story with the rest of the world. Educators like me who take Tyler’s science and work our magic to turn it into cool interactive experiences and programs for guests at the Museum. So why send an educator out into the field to dig up dinosaurs too? Because now my experience is that much more authentic. Sure, I can read about the KT and look at the dinosaur bones and listen to scientists. But now that my hands have touched the bones of the last dinosaurs before that huge asteroid impact my enthusiasm and excitement is that much more authentic and contagious. Now when I write training manuals for volunteers or lead volunteer trainings for the over 100 amazing volunteers in Prehistoric Journey my passion for knowledge and science will be shared with unbridled spirit. What are you passionate about? Be curious about it, go explore it and share it. Excitement is contagious. Forgetting a shovel, or brushes, or pickaxe would make it hard to collect fossils. Forgetting a notebook would make it impossible. 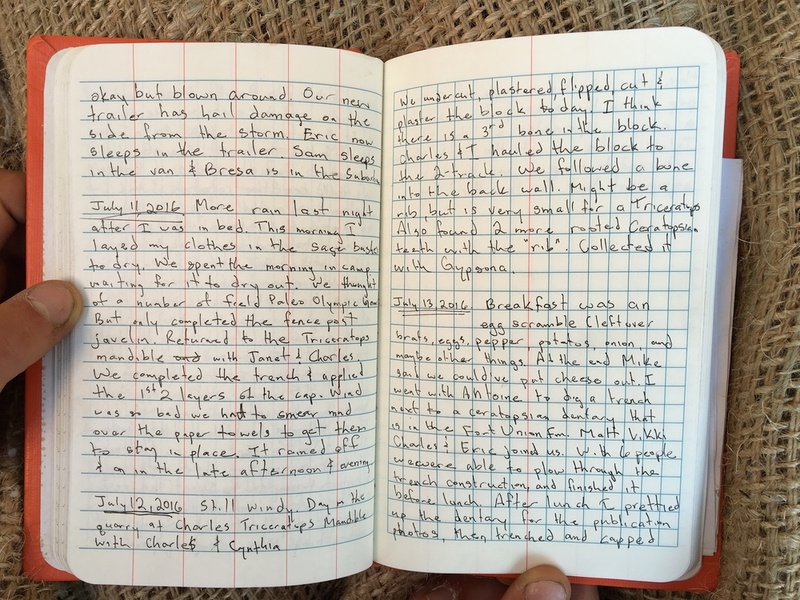 Field notes are the backbone of any good field research program. 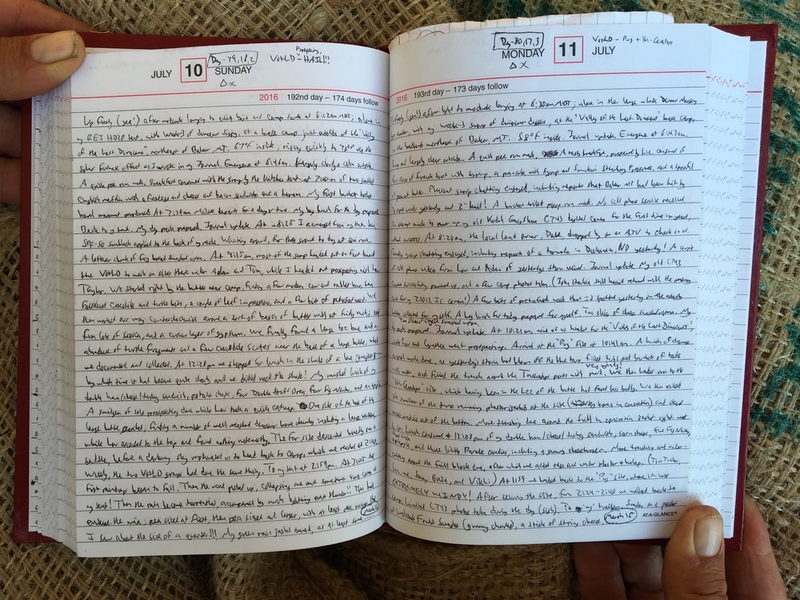 Here are a few views from the notebooks in our camp this weekend. Check out the new publication from Dr. Tyler Lyson about the evolution of shells in turtles. A few days ago I found a nice microfossil site, which is a concentration of small bones and teeth, most not bigger than a quarter. These rich concentrations tell us a lot about what animals were living together in a given ancient ecosystem. In this particular microsite, I found a very nice dromaeosaur, or “raptor” dinosaur tooth likely pertaining to Acheroraptor, one of the last of these famous bird-like dinosaurs. I was lucky enough to name Acheroraptor a couple of years back, and we found that it indeed is very closely related to its famous cousin Velocirpator, of Jurassic Park acclaim. As most of us who are interested in dinosaurs know, these raptor dinosaurs shared many similarities with their living bird cousins, including feathers and wings, a wish bone, enlarged brain, a sophisticated respiratory system, and in many cases small in size. 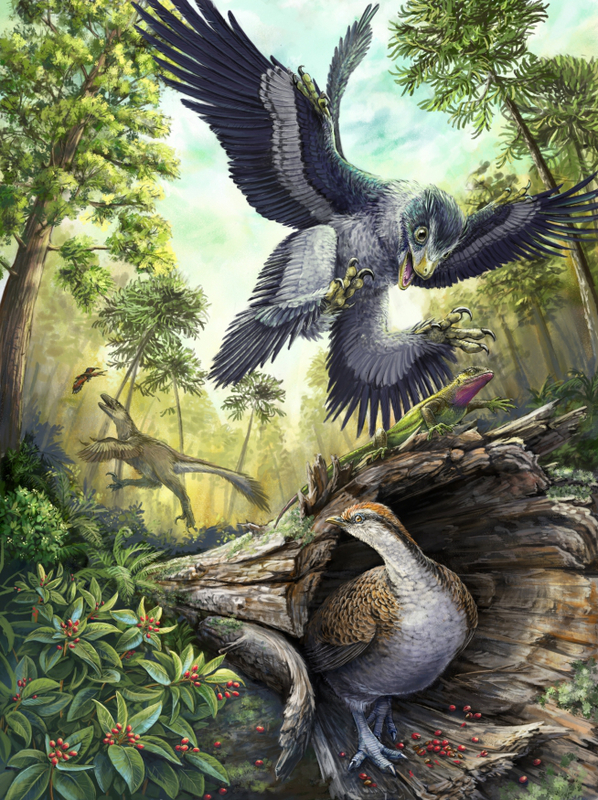 So why did the ancestors of today’s birds survive the asteroid impact that ended the Age of Dinosaurs, while their ecologically similar, small, feathery raptor cousins die out? This has been one of the biggest mysteries surrounding the K/Pg extinction. And as it turns out, those tiny fossil teeth are really important in addressing that question. In new research from my lab that was released last month, we analyzed over 3000 teeth of raptor dinosaurs and early birds from the last 18 million years of the age of dinosaurs in order to understand how patterns of their ecology, as judged by the shape of their teeth and related diets. We used teeth because the small, delicate, and hollow bones of small feathered dinosaurs and birds are destroyed before they even become fossils. But the enamel-covered teeth are hard and resilient, and fossilize well. They showed us that these dinosaurs were a consistent and stable part of the ecosystem leading up to the end of the Cretaceous and their extinct very sudden in geological terms- at the K/Pg boundary. So how did birds survive? The preserved bird and bird-like dinosaur teeth belonged to animals that ate a variety of other animals- like insects and small vertebrates. However, modern birds (Neornithes) differ in having a toothless beak-so we hypothesized that diet might have been a key factor in their survival. And if the feathered bird-like dinosaurs that ate animals went extinct, perhaps birds survived because they could eat plants, or more specifically, seeds. In the conditions in the wake of the asteroid impact, global forest fires raged and the sun was blocked out by debris ejected into the atmosphere. Plants would quickly lose foliage, which would decimate animals, like raptors, that were tied to photosynthetic food webs. But seeds would be high-energy packets of food that would persist on the landscape, and any animal that could access them would have an ecological advantage. IF the ancestors of at least some groups of modern birds could access this resource in the critical time period immediately after the impact, that could have been vital to the survival to the ancestors of at least some groups of our feathered friends we see today. A small crew (~2-6 people) allows you to be more nimble, to react more quickly to changing conditions and avoid delays. However, a small crew limits what kind of work can be done, and as a result most excavations must be relatively small and multiple simultaneous excavations are rarely possible. This sort of field work is typically more targeted, such as during my Masters research, where we focused on collecting particular small specimens (fossil stem-pinnipeds) in the Canadian Arctic Islands or were mapping multiple sites in the Canadian Arctic, fording rivers, crossing tundra, and using helicopters and small planes to cross greater distances. Larger crews (~15-30+ people) are effectively the opposite of small crews: you are much slower to react to changes (which can often cause significant delays), but you have a much greater ability to tackle larger excavations or run multiple simultaneous quarries. This sort of strategy is typical of most major dinosaur research groups, like Tyler Lyson’s Marmarth group or the Southern Alberta Dinosaur Project. Both strategies have their advantages and disadvantages, and need to be tailored to the goals of the research in mind. Marmarth Research Foundation is special. Plenty of other people will show this through their photos, videos, and posts this summer. I worked with a myriad of people, from those looking for a bit of adventure after retirement to professionals doing field work for their scientific research. I'm not there yet, but I want to be a professional paleontologist more than anything, so I relished the time I spent with everyone at Marmarth. You've heard about the cool research coming out of the foundation all summer long, but MRF has another value that is hard to express in words. Here’s something you don’t hear many of us say: becoming a scientist is hard, and becoming a paleontologist is even harder. The networks of peers, mentors and colleagues that you create through your hard work is often just as important as your credentials on paper. After graduating in May, I’m at a weird crossroads in my education and career. I grew up always wanting to work with dinosaurs in whatever way I could, and I’ve worked very hard to pursue that goal. I’ve done collections work, and even some field paleontology through the years. I have a decent job working with fossils and trying to work my way up the ladder, as they say. But finding ways to participate in real scientific research hasn’t been easy, even for a dedicated student like myself. But where do you look for those opportunities? How do you get involved with researchers that can help grow my networks and gain the experience I need to move to the next level? I know having a PhD is important, maybe a make or break for my career, and I'm definitely smart and driven enough to earn one, but so far I haven’t tried to pursue that path. Maybe because I didn't think I would be accepted into a program. I’m scared I don’t know the right people. I feel a bit like an imposter at times. With years ticking away, sometimes I feel behind everyone else in this field. Like they got some memo that never made it to my inbox about what to do next. There's no map for how to do this. This field season, The Marmarth Research Foundation answered loud and clear. As soon as I arrived in this tiny town, my network started growing. Walking around this collaborative research facility were some people that I consider giants in the field of paleontology. There were researchers from Yale, Brooklyn College, The Smithsonian, The Denver Museum of Nature and Science, Royal Ontario Museum and they needed my help and input. They gave me a role and a chance to actually participate in the real science happening here in the field. Spending time in the trenches (literally) with these people gave me a valuable chance to learn what a career in paleo actually looks like. Turns out, I’m not the only one who’s taken a unique pathway into this field or felt like an outsider at times. I owe a huge debt of gratitude to Dr. Tyler Lyson for allowing me be part of this summer’s field work at MRF. 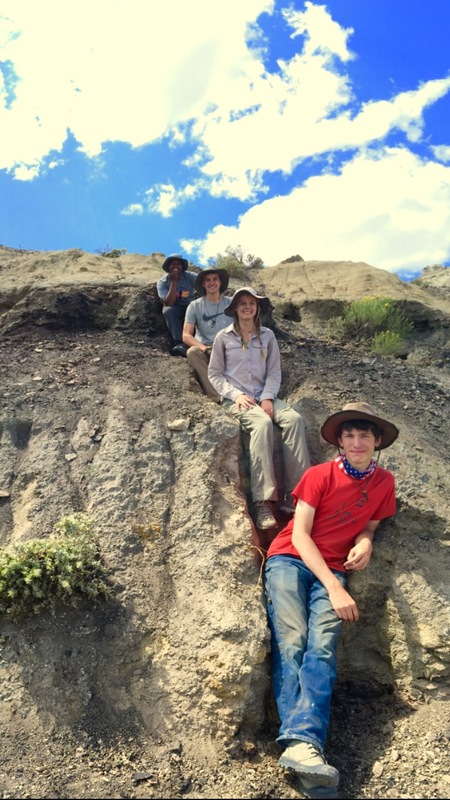 This is a place for emerging scientists like me to see research in action and find a connection with professional paleontologists already working in the discipline. As a resource for mentorship it’s priceless. I also owe great thanks to Dr. Lou Taylor and Dr. Stephen Chester for taking time to talk to me and ask about my interests and experience. Such a simple act made a bigger difference in my life than they can know. And all of the other staff, volunteers, and students who made the experience fun…thank you. After years of feeling directionless, Marmarth gave me a bit of clarity. I often feel like I'm the only person who is struggling, but in reality, every scientist or hopeful scientist has gone through a similar crisis. It's really hard to admit that you sometimes don't see the next steps that will help you achieve the career you envision for yourself. Sometimes I need to vent about the feeling of being a bit ‘lost’ in academia. But the movers and shakers in science, the only people qualified to help me address these feelings, are the very same people that I need to impress with a well polished vision and resume. Opportunities like this field work experience at MRF give us the chance to make real connections with the people doing science and lets us observe the way that scientific careers bloom. Lately I’ve felt a bit like there was one singular, definitive path to becoming a paleontologist. I’ve been paralyzed thinking that it was a path I might not even be on. Now, after having spent time out in the field working side by side with all of these professionals I’ve realized that each of them has a story as unique as mine. Everyone here has a different life experience, educational background and life story that has led them to their varied careers. Yet they here they all are, in Marmarth, North Dakota, involved collaboratively in one of the coolest paleontological research projects in science. As I write this I’m sitting in an airport flying back to my life at home with a funny thought in my head. On a map Marmarth, North Dakota is the absolute middle of nowhere; yet in terms of research paleontology it’s pretty much the center of the universe. My crew from the Royal Ontario Museum (ROM) in Toronto, Canada, is spending time this week working with my good friend and colleague Dr. Tyler Lyson and his team from the Denver Museum of Nature and Science and the Marmarth Research Institute. 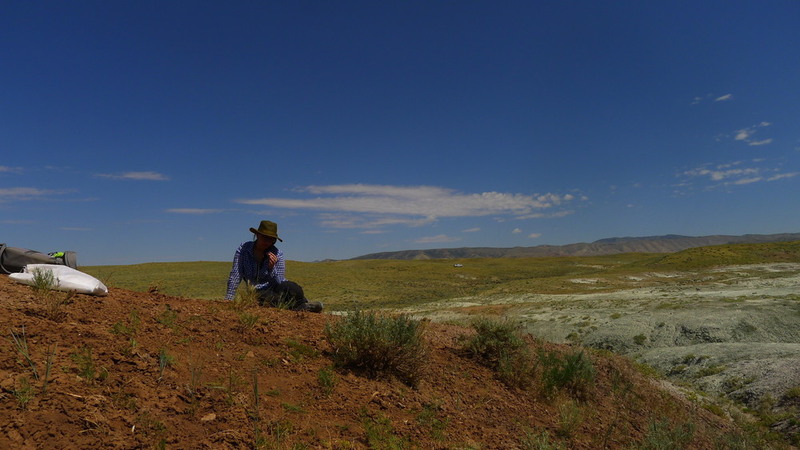 We are hoping to work together on projects looking at the dynamics of dinosaur extinction, while at the same time working private ranch land to collect fossil for the ROM collection. But why not study the extinction of the dinosaurs in Canada? It is true that K/Pg boundary outcrops in several areas in Canada where the fossils of land-living and freshwater animals are also preserved in the rocks. Two sections are particularly notable- the Scollard Formation along the Red Deer River of Alberta, and the Frenchmen Formation in southern Saskatchewan. Although these rocks produce the classic “last dinosaurs”, including T. rex and Triceratops, there is precious little rock outcrop to explore, they only preserve a small sliver of time immediately before the asteroid impact layer, and good skeletons and skulls of dinosaurs are very rare (and yes, T. rex is known from Canada!). This makes amassing a large fossil dataset to study dinosaur extinction in their last few million years tough north of the border. The vast exposures of the Hell Creek Formation in North Dakota and Montana, which are rich in fossils, are the best natural laboratory for studying an extinction event that changed world. A beautifully preserved shinbone of an ornithopod dinosaurs in the Scollard Formation. Hiking back to the truck from my first day at the quarry, I was excited to discuss the day’s big find with anyone in earshot. In the morning Tyler, Erica and I had discovered the fossilized left and right squamosal and a brow horn of a young triceratops just below the K/Pg boundary (see picture below). When I say right below the boundary, I mean right below the boundary, no more than 1m below the contact. It’s one of the last dinosaurs to roam North America, just before the destruction of the extinction event. It was the first dinosaur fossil I ever discovered. and I found it just a few hours into my first day in the badlands- I am usually not that lucky. It was a childhood dream come true and I got to touch the horn of one of the last dinosaurs on earth. Seriously incredible. As I was walking back to the truck with some of the crew, our conversation about the impact of the day’s work slowly transitioned to a discussion of the mass extinction that ended the reign of the dinosaurs. That’s what a fossil discovery like this one can do. Almost immediately after touching this find with my own hands I couldn’t help but think, “Dude. Imagine a day in the life of this animal I just uncovered”. It is crazy how one single moment in time can have such a large impact on Earth’s history, if not for that asteroid I might no be here writing this. You might not be around to read this post. That’s one of the reasons that this project is particularly important scientifically. It gives us a greater understanding of the mechanisms of mass extinctions, and ecosystem recovery. This information is particularly relevant because the earth is entering the 6th mass extinction that could claim between 30-50% of all the life on earth. I do not know about you, but I think that is terrifying. It is a concept that is difficult to grasp and fills me with a sense of dread. Today’s discovery kind of made it all seem real. One minute, dinosaurs just like this one I found in the mudstone were living and thriving in the floodplain forest with all the plants, animals, rivers and streams that they had lived beside for their entire lives. In a moment, it was all so different. Everything they knew was turned upside down and wiped from the planet. When I hear people talking about the extinction of life happening around us now it seems a little abstract. Something about touching this fossil brow horn from a dinosaur burried so close to the impact layer made it seem a bit more real. Even though changes to my daily life are few, the extreme changes occurring in the biosphere, in the atmosphere, the cryosphere, and the hydrosphere are being noticed right now by scientists. These scientists predict that as the century progresses we will be faced with more extreme challenges that could including drought, increased storm intensity, a redistribution of rain patterns, rising sea levels and a massive reduction in biodiversity. I do not know if civilization, or even the human race can survive these challenges. We have been shown to be extremely adaptable animals, but this is one challenge we may not be able to overcome. I’m sure this Triceratops that I discovered would have felt similarly invincible just before the world changed forever. Unlike Triceratops though, I can’t just blame some extrensic phenomenon like an asteroid for the change happening to my world. I’m coming to terms with the idea that I myself am a part of this problem. I participate in a lifestyle and culture that often demands consumption. Somewhere along our evolutionary journey it became advantageous for humans to consume but it is now becoming necessary to relinquish that drive to consume. I’ve heard colleagues say that any dinosaurs within a certain radius of the actual asteroid impact could see into space as the asteroid vaporized the atmosphere in its path. I think I would rather die seeing the entire solar system instead of watching the planet die around me. Sitting out here after dinner tonight, looking into the milky way and about a million stars I’ve never seen before, I feel like I can almost relate. After my first week I was reflecting on the truly caring individuals I have met at the Marmarth research station and beyond. Our species evolved with some bad habits, but we also evolved empathy, intellect, and this incredible tool we call science. It definitely gives me faith that we can make changes to preserve this beautiful planet and the life we’ve come to enjoy that covers it. Ive been working with some pretty high-tech tools all day. If we can put a satellite into space that can calculate the position and elevation of a fossil with an error between 5-10 cm, and use fragments of fossil to unravel the complicated story of life on earth, I bet we can address this problem and do something about it. I hope our research and the research of the rest of earth’s scientists can be used to create a scientifically literate culture capable of keeping us from going the way of my Triceratops. Marmarth, ND Population 84. Make that 85. I should be used to the summer routine of Marmarth field season– it sounds so simple, really – just pop off to the badlands, show some people the joys of field work, and before you know it, right back home again. But of course, things are never that simple. This year, I had a project at work that absolutely had to be finished before I left. I had an obligation to another dig in Tennessee that’s really come to rely on me. I have children out of school for the summer and a wife with obligations of her own. So I felt pretty rushed and disorganized, and this year Tyler (do I get to call him Tyler since I knew him before the doctorate?) has some fossil sites that might be pretty scientifically important, so I need to be on my game. Now that I’m here, it all comes back pretty easily, and the hard work is all worth it for some important reasons. First, I’m contributing to actual, real-life science – that’s a big old sackful of awesome. Second, I get to work with some of the best people I’ve ever met. Third, I get to help those people experience the joy of scientific discovery, with the added bonus of forcing them to dig through tons of rock and dirt, because I’m a terrible person. And fourth, but definitely not least, every time I’m out here, these wonderful people enrich me with new knowledge, with humor, with amazing stories, and especially with camaraderie. Is it worth the blisters, the aching back, the heat, the dust, chipping through obnoxious concretions and sometimes coming up empty-handed? Hell Creek yes. Some of my favorite people in a room with some of my favorite fossils. Somedays digging for dinosaurs is a lot of work. When you see the pickaxe...it's one of those days. We are finally settling into the tiny town of Marmarth, North Dakota, population 84 my home for the next couple months. We are working out of the Marmarth Research station and I’m meeting the other scientists, staff, volunteers. So far everyone is cool. It’s a really diverse group of people. I’ve had conversations with people about topics ranging from paleontology to clean energy to archaeology, food and television. The people here rock (and they fossil pretty hard too), but the best part of my time out here so far has been working. Going out to the field site is more like a rollercoaster than a car ride, with washed-out 2 track “roads”, etc. The site itself is so far from anywhere that I’m not too sure exactly what state we are in most of the time. Montana I think, or North Dakota? Does it even matter when you are just looking at 25,000 acres of pasture and badlands and this far out of the reach of technology and civilization? I got booked for Science-ing. haha. and I’m serving 8 weeks. Beinga part of the Howard Hughes/Denver Museum blog has been an interesting experience for me, too. I’ve never built a website or edited a video in my life- but I’m learning fast. Doesn’t help that the entire project is built on Mac computers, and I’m a PC guy. It’s been a bit like learning to swim by jumping into the deep end. Thankfully it becomes easier the more and more I do it, and my wonderful boss (I hope he reads this) has helped me so much with everything. At first I was hesitant about spending a great deal of my time behind a computer, but now I’m really excited to create this b/vlog. Sharing this crazy experience (and the incredible science we are producing) has been really fun so far. I’m looking forward to receiving questions from our audience, so fire away if there is anything you are curious about. And if you just want to laugh at an intern slowly falling down on a hill on his first day at a new job, Check out my #fieldworkfail from the first day in the quarry!